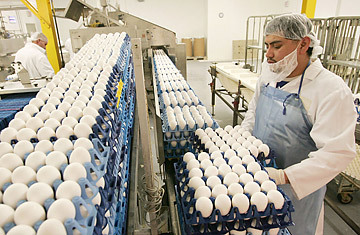 A food worker prepares eggs for inspection in Lansing, Illinois. Amid increasing reports of food-borne illness, the GAO is calling out the Food and Drug Administration for failing in its duty to ensure the safety of the nation's food, particularly its fresh fruits and vegetables. Thousands of people have been sickened; the produce industry has lost millions of dollars. After studying farms and facilities and reviewing the FDA's practices for preventing contamination, the GAO makes an urgent if predictable recommendation: the FDA's authority must be expanded and its strategy updated, or Americans' health will continued to be threatened by the food they eat. "[T]he consumption of fresh produce has increased as both health experts and the U.S. government have encouraged Americans to eat fruits and vegetables as part of a healthy diet. According to the U.S. Department of Agriculture, the average American annually consumed 13 pounds more fresh fruit and 50 pounds more fresh vegetables from 2003 through 2005 than from 1983 through 1985, an increase of about 14 percent and 41 percent, respectively." 2. On the FDA's sluggish research and regulatory updates: "FDA last set its research priorities 8 years ago and has not systematically worked with others to supplement its research agenda, including research relating to fresh produce. FDA's 1998 good agricultural practices guidance has not been updated, and its current good manufacturing practice regulations for food, which includes fresh-cut produce operations, was last revised in 1986." "The agency's food-related funding has not kept pace with inflation, with FDA losing 800 scientists, inspectors, and other critical food safety staff since fiscal year 2004." Originally requested by Senators Ted Kennedy and Barbara Boxer after the great bagged-spinach E. coli fiasco of 2006, the report arrives on the heels of a salmonella outbreak earlier this year, linked to tomatoes and peppers, which sickened at least 1,440 people and was America's largest food-borne-illness outbreak in a decade. Meanwhile, toxic additives in milk products in China have killed four infants, sickened 54,000 and led to recalls of Chinese dairy products worldwide. These reminders of what's at stake make the facts all the more troubling. The FDA devotes only 3% of its food-safety spending each year to fresh produce, which is especially important because it is often consumed uncooked. It examines less than 1% of produce imported into the U.S., despite the fact that the amount of imported food has grown dramatically in recent years. The FDA is responsible for ensuring the safety of 80% of the U.S. food supply. But without an arsenal of increased scientific research, expanded authority and more manpower, it's a war we're in danger of losing. Click here for photographs of America's urban farms.